Some of you may have noticed that last month, we didn't have a Constellation Showcase. I was on winter break and ended up not getting around to it. So I'm going to make up for it with this month's Constellation Showcase. 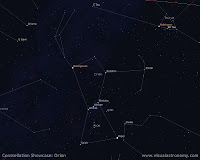 The Constellation Showcase is a monthly segment detailing a currently viewable constellation, typically somewhere along the ecliptic or high in the Northern sky. This month's special edition will focus on one of many amateur astronomers' favorites: Orion! One reason Orion is a favorite among astronomers is how easy it is to find. In January, Orion will be easily visible to the South (if you're in the Northern hemisphere). In the South, you will see three bright stars in a horizontal line; this is Orion's belt. Above and below these stars is an hourglass shape, which forms Orion's body, as seen in the picture at top right. Aside from being very easy to find, Orion is full of great objects to see in even the most modest of telescopes, as we will see below! In Greek mythology, Orion was a hunter. Orion makes his first appearance in Homer's Odyssey, and several versions of his story follow. In one such myth, Orion is killed by Artemis, a giant scorpion, which would become the constellation Scorpius. The Egyptians also assigned this constellation great significance as Osiris, the god of the underworld. Osiris played a major role in Egyptian culture and mythology, and it is theorized that (although they were built at different times) the pyramids at Giza were aligned to mimic Orion's belt. The constellation Orion contains possibly the most beautiful deep sky object accessible to amateur telescopes. That would be the famous Orion Nebula, or M42. 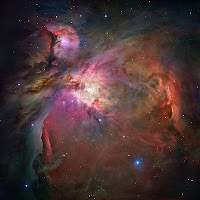 The Orion Nebula is an emission nebula in Orion's "sword". This beautiful nebula is one of the brightest in the night sky and can be visible to the naked eye from dark sky sites. M42 is estimated to be 24 light-years wide and 1,270 light-years away. This nebula is a real treat in even the smallest of amateur telescopes, while larger telescopes (10" and above) will start to show a good bit of detail and a tiny bit of coloration. For example, on a dark night, I can detect a greenish tinge to the nebula in my Z10 dob. This is due mostly to the fact that the human eye is the most sensitive to green light. The other great thing about M42 is that there is so much to look at. Being a rather large target, it looks great at every power from wide-field to high-power! If your collimation is spot-on and the seeing is excellent, try to see all the stars in the Trapezium, the densely populated stellar center of the nebula. This sketch will show you what you can expect to see in medium to large telescopes. In larger telescopes, the Horsehead Nebula is also a great target. Although the actual "horse head" shape is out of reach of all but the largest telescopes, you may still be able to see some of the nebula. The "horse head" shape actually comes from a dark nebula in front of a bright emission nebula. In the picture to the right (courtesy of Hunter Wilson), you can see this horse head shape as a dark protrusion into the main nebula. Also visible in this image is NGC 2024, the Flame Nebula. The Flame Nebula is the bright nebula in the lower left side of the image. The entire sword of Orion is full of nebulae, and is a very active star-forming region. Viewing this region at very low power or in binoculars is often the best view in the winter sky. Orion is also home to several interesting stars. One of these is Betelgeuse, a red supergiant which can be seen as Orion's left shoulder (at the top left of the constellation). Betelgeuse is so large that its diameter is larger than the diameter of Mars' orbit! The image at left (courtesy of NASA/ESA) shows Betelgeuse in ultraviolet light. Red supergiant stars don't typically live very long (in astronomical timescales), and it is theorized that Betelgeuse is nearing the end of its life, at an age of 8.5 million years. 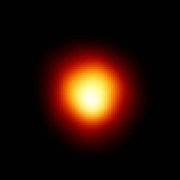 At the end of its life, Betelgeuse will likely become a supernova and outshine the Earth's full Moon in the night sky! This event may have already happened, and the light hasn't reached us yet, or it may not happen for thousands of years. Scientists are unsure as to the timing of this event, but one thing's for sure: it won't be easy to miss! Sigma Orionis is also an interesting star, as it is a multiple star. Sigma Orionis is actually composed of five stars. Four are easily visible to amateur astronomers, and make for an interesting multiple star during nights of good atmospheric stability. The fifth star actually appears to be part of Sigma Orionis A, as it is much dimmer and is very close to its companion star. 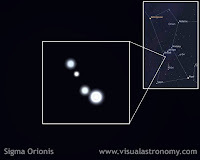 Sigma Orionis can be found between and below the stars Alnitak and Alnilam in Orion's belt. I could only imagine what the view from such a system's planets would be like (if it has any). Click the picture to see Sigma Orionis as one would through a telescope. Amazing :).. Orion is one of my favorites because it is just so very easy to spot.